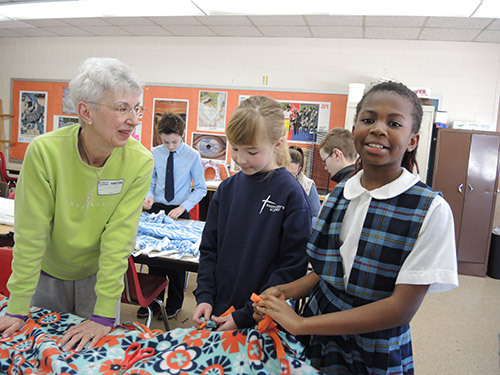 St. Mary’s Academy follows the policies of the Diocese of Springfield for admission. The policy states that parents of students in grades Pre-K through 8 need to complete a registration form, present an original birth certificate and Baptismal certificate, (if Catholic), health records, and a $50 application fee. The decision for acceptance is based on any existing elementary records, if applicable, and a parent and student interview. If necessary, there will be a request for a letter of recommendation from former school. A $100 non-refundable deposit is required upon acceptance and will be credited toward the upcoming academic year’s tuition. Those entering Pre-K 3 must be three years of age before September 1st, and Pre-K 4 students must be four years of age before September 1st. Kindergarten students must turn five years old before September 1st of the year in which the student is entering. Applications are first available at St. Mary’s Annual Open House, which is held on the last Sunday of January. Protocol for admission is as follows: siblings of current students, parishioners of St. Mary’s Parish, transfer students from other Catholic schools, practicing Catholics from other parishes, Catholics, and non-Catholics. Decisions regarding acceptance are mailed out by mid-March. St. Mary’s Academy is considered a regional school because the majority of our population is not from the town of Longmeadow. We attract students from surrounding communities, such as Springfield, East Longmeadow, Wilbraham, Hampden, South Hadley, Agawam, Monson, Suffield, CT and Enfield, CT. St. Mary’s Academy serves its mission by reaching out to families of all religious affiliations.